This is my first ever Cadillaquer and I've got to start by saying I received great customer service. 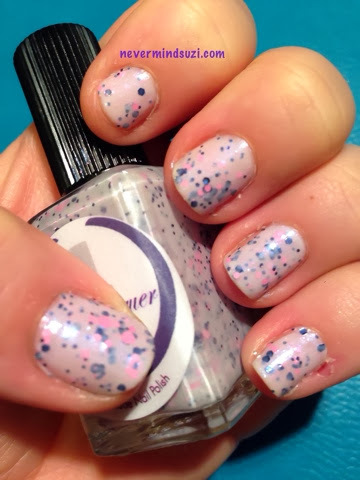 My first order went missing and it came to light that Royal Fail had seized it due to postage restrictions (yes I ignore them but the polishes are all so pretty). But a second order was reissued and I thankfully received it. This is a very muted lilac/white with a violet hued shimmer in it. Violet and pink glitters added for that extra bit of sparkle. 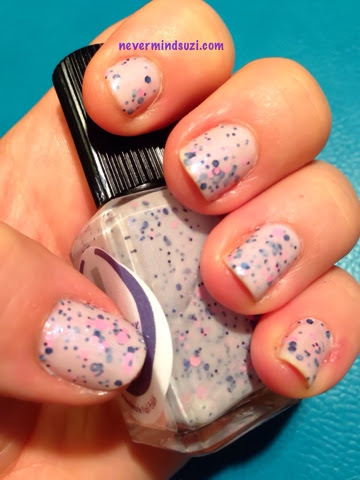 Even though this looks quite sheer the opacity built up well in 2-3 coats. And the formula had a nice consistency. Hope to try some more of this "new to me" brand in the future.